Drew Storen was not happy when the Washington Nationals traded for Jonathan Papelbon. Revere fills #Nationals’ need for LH hitting outfielder who can play center and left. No need to trade Gio for that piece now or FA signing. #BlueJays leadoff options become Pompey, Saunders, Travis (once healthy) … or Tulo, who did so 26 times in 2015. Like this trade for everyone. #BlueJays needed reliever, were deep in OFers. #Nationals needed LH hitting OFer. 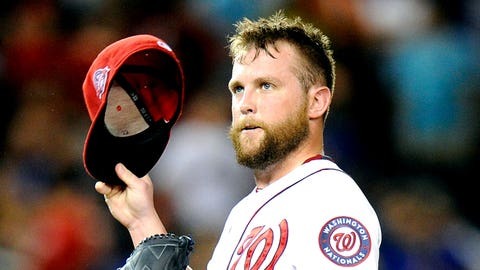 Storen needed change. Source: Cash going from #Nationals to #BlueJays in trade will even out difference in salaries between Storen and Revere. As others have noted, #Nationals will control Revere for two seasons, #BlueJays will control Storen for one. Revere led the NL with 184 hits in 2014 with the Phillies. In six seasons with Minnesota, Philadelphia and Toronto, he’s hit .295 with 176 steals.